Westfall is full of dust devils. And buzzards. And crazed golems. And pirates. Why does anyone live here? This should probably only have Overload 1 with how often it just gets pinged. Using Paladin with Steward of Darkshire. Summons a Dust Devil, which gains Divine Shield. when r u going to see play? It would need stealth to see play as a one drop in constructed, but that's probably too op. IDN, just a poor card as it is now, really screws you sometimes. Wouldn't recommend for serious ranks but I've had fun with it. My Reno Jackson set includes The Mistcaller making this a 4/2. If you can hide it behind a taunt it'll do work. It's name literally has "dust" in it. On paper, this card is actually good. In practice, this fails so hard. This article discusses the stat budgets for cards, but in short: a minion gets ( 2 * mana cost + 1 ) stat points to work with. 1 stat point buys 1 attack or 1 health, and windfury costs points equal to the attack of the minion. Therefore, this costs 3 total and has (3 + 3 + 1 = 7) stat points about it. It even has overload as part of its cost, which is actually an upside over it being 3 mana up front. But it never actually works in practice. It's a Magma Rager with overload. It dies to a 1 damage hero power (which is always possible to do right after this regardless of whether you go first or second), in which case you paid 3 mana and a card where they paid 2 mana and no card. That's game losing. The definition of a strike-out/home run card. Either brutally murders opponents or dies to 3 of the hero powers. On the bright side: This guy is getting a second life thanks to Hungry Dragon! So will there be a revival with hobgoblin? 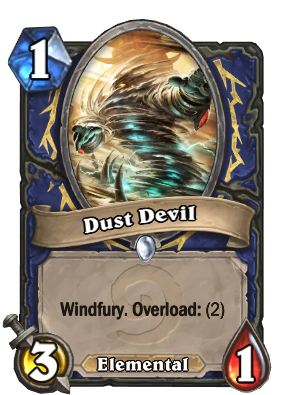 DAT 5/3 DUST DEVIL! #sarcasm. Turn 3 do a flametongue totem and you win the game. It's the Kripparian Prophecy: Shaman turn 3 win. I would recommend NEVER playing this turn one, due to the overload costing you a totem drop on turn 2 or any other play. Chances are better than not your opponent has 1 damage in control when starting a match. I run this in a deck, but I only use it waaaay late in the game, around turn 7 or greater. My strategy: Control your opponent, and make him use all of his removal, have a taunt or two on the field (this combos well with the wolves) before dropping him, and prep him up with bloodlust or rockbiters before attacking and he'll end the match. My strategy: use a different card. Seeing how Shaman has no draw power, perhaps change this into a 1/2 for 1 mana and draws a card(Like Novice Engineer pre-nerf). You would need the coin turn 2, and since you're going second, your opponent likely has some sort of removal on board/hand/hero power to removal Dust Devil.